And I also like to share one important tip with you is not to have the same password for your Facebook, Gmail, Yahoo bcoz if anyone knows that your facebook password is same as your Mail password, he will also login to your gmail/yahoo and reads all your personal emails. You must also know that If someone ha*ks your facebook password and gain access to your account then you can get back your facebook account by using the recovery option which is connected to your Gmail/Yahoo, but what if you keep the same password for your Mail account as Fb? The ha*ker will simply change the Mail account’s password and now you will lose the recovery option as where you will lose your permanent recovery option to your FB account. So that’s why I am suggesting you to have different strong passwords for all of your different accounts. One of the important steps for how to secure facebook account is Adding Secondary Email ID to your facebook account. This will help you when your profile is ha*ked. Fb will send account recovery information to the secondary email ID also. So I suggest everyone to add your secondary email id. So when you add Secondary Email Id, Facebook will ask for Email Confirmation which means you have to to verify the email address by checking the mail at your respective Email Inbox. 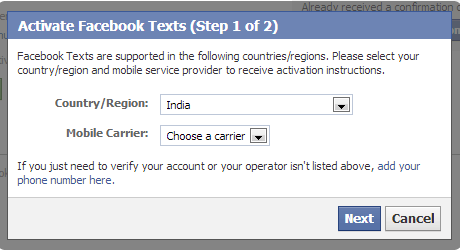 Connecting your personal mobile number to your facebook account really helps you a lot in securing your facebook account, like when anyone ha*ks your FB account, you will be able to recover your lost account by mobile easily or if your facebook account was temporarily locked you can gain access to it by confirming it with your connected mobile number. This plays a crucial role to secure facebook account. Make sure that the secure browsing is always enabled in your facebook account. If not, Click Here https://www.facebook.com/settings?tab=security&section=browsing&view to enable secure browsing for your facebook account. By enabling this secure browsing feature, you will be browsing your facebook account in a secure connection [https] which helps you to keep your account safe from spammers, viruses, and hackers. Login notifications will help you to get notified when someone else is trying to access your account. It means when anyone is trying to access your FB account from a computer or mobile that you haven’t used before, then facebook will notify you by sending a message to your Email inbox, Mobile inbox. Enable both Email and Text message option so that whenever you are away from Computeryou will be notified by your mobile at least. You can use this Code Generator in your facebook mobile app to reset your password or to generate Login Approvals security codes. You can enable this feature on your android mobile or iOS. 2.Think before you click on any link. 3.Log in at www.facebook.com only.